Ask The Host: How much help is Jeremy Clarkson's new Millionaire lifeline? Who Wants To Be A Millionaire is back. But not quite as we know it. The show has returned to ITV this week for a nightly series of specials, hosted by Jeremy Clarkson, to celebrate its 20th anniversary. And producers have been careful to make sure the reboot is 2018-proof. The "phone a friend" lifeline, for example, sees a producer sent to the friend's house to make sure they aren't Googling the answer during the call. Then there's the updating of the famous catchphrase "We don't want to give you that" - previously uttered by Chris Tarrant when holding out a cheque to a contestant. Instead, Clarkson told one player on Saturday: "We don't want to give you that... because literally nobody in the world knows what one of these is any more. "In this modern Who Wants To Be A Millionaire, we're going to transfer the money to you using electricity." But perhaps the most significant change is Clarkson's involvement in the actual quiz process itself. 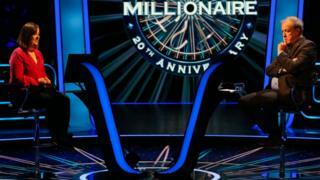 The basic format of the show remains the same - with contestants asked a series of increasingly difficult questions as they try to win the £1m prize. The elusive jackpot can only be won if all 15 questions are answered successfully. A series of lifelines are offered, including ask the audience, phone a friend or 50:50. This year's series has seen a brand new lifeline introduced - ask the host - which allows contestants to tap into Clarkson's own general knowledge. An ITV spokesperson told BBC News: "We wanted to bring back this iconic game show with some new twists to celebrate its 20th anniversary. Adding an additional lifeline of 'Ask The Host' felt like the perfect fit with Jeremy Clarkson at the helm." The idea didn't get off to the greatest of starts when Clarkson was reportedly asked a question about feminist literature during an unbroadcast pilot episode. When one contestant couldn't correctly identify Sylvia Plath as the author of The Bell Jar, he asked Clarkson, who was equally stumped. Given the high stakes, pressure on Clarkson is high. "Imagine the embarrassment if somebody is up for £125,000 and they ask me and I get it wrong! I'd be dying of shame," he said. Asking the host is a brand new lifeline and hasn't been used in the format in any other territories around the globe. In the new episodes, any time Clarkson is asked a question, he makes clear he has no earpiece or connection to the outside world, and nor does he see the answer on his screen in advance. In the first four episodes this week, seven contestants asked the host. Clarkson gave three of those the right answer. With the other four, he decided he wasn't sure enough to give an answer (although, in talking through the options, he did inadvertently steer a couple of contestants away from the right options). Skip Youtube post by Who Wants To Be A Millionaire? End of Youtube post by Who Wants To Be A Millionaire? Image Copyright Who Wants To Be A Millionaire? Who Wants To Be A Millionaire? What Clarkson said: "So. Here's what I think. I dunno. "I'm going to say it's almost certainly a hexagon... but I think it could be an octagon. [Thinks about it for a while.] I'm more inclined towards an octagon." What happened next: Having exhausted both his "phone a friend" and "ask the host" lifelines, the contestant then used his 50:50, leaving him with pentagon and octagon. He then correctly opts for octagon. Viewer reaction: "I don't drive and I even I know it's an octagon," said Michael - one of the few people not to include swearing in his tweet about the contestant's lack of knowledge on road signs. "Am loving Jeremy Clarkson on Millionaire but getting frustrated at how easy questions are causing the contestants to lose their [minds]," added Nicki Speck. Skip Youtube post 2 by Who Wants To Be A Millionaire? End of Youtube post 2 by Who Wants To Be A Millionaire? Phew. Clarkson's back on safe ground, surely? What Clarkson said: "I hate cricket," he said. "I loathe it nearly as much as I loathe golf." "But I do know where the Oval is," he continued, "and it isn't in Hampshire and it isn't in Essex. And it's much nearer to Surrey than it is Middlesex." "I think it's Surrey... I'm 60% sure." He encouraged Ricky to play, as doing so wouldn't lose him the £1,000, which was guaranteed. "And we can move on to a contestant that has some general knowledge," he added (meanie). What happened next: Ricky went with Surrey - which was correct - and ensured Ricky progressed from £1,000 to £2,000 - having used up a lot of his lifelines early in the competition. "What are your specialist subjects?" mocked Clarkson. "I'm starting to wonder," Ricky joked. What Clarkson said: "It's not gone terribly well for everybody, this [lifeline]," he correctly pointed out when Lynn Buckingham asked for his help. Clarkson was torn between Hague and Fox, but, he pointed out: "That's just an inkling, and it's not enough to risk you losing £31,000." What happened next: Lynn phoned her husband. "I've been useless to her," Clarkson told him. He was, at least, correct about this. The husband goes for Hammond [the correct answer] but isn't sure. Lynn opted for Hague instead. And promptly lost £31,000. Wouldn't fancy the atmosphere at the breakfast table the next day. Viewer reaction: Kevin Sermon pointed out that, in another situation, Clarkson would have aced a question like this. "Love the new format of millionaire. Last night Jeremy Clarkson was beat when the answer about a post in May's government was Hammond." It's a fair point - Clarkson just needs to hope for a question about Richard Hammond and James May and will stand a better chance. So - does ask the host work? Well, we like it. But not everybody does. Many viewers seem to be sold on Clarkson as a host - but not necessarily as a helper. "I thought Jeremy Clarkson was a poor choice for Millionaire - how wrong I was. He is excellent (apart from answering the questions)," tweeted Piers Croft. But Mr Polly suggested: "The only time you'd use 'ask the host' is if a car question came up." Bee Jones had perhaps the most useful advice: "If this comes back for real and they keep the Ask The Host lifeline, they'd better get Jeremy Paxman rather than Jeremy Clarkson." Jeremy Clarkson replaces Chris Tarrant on Who Wants To Be A Millionaire? ITV - Who Wants To Be A Millionaire?